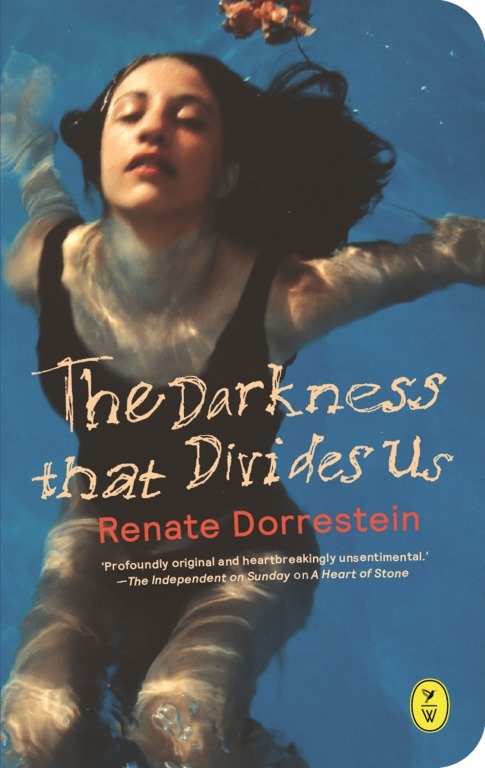 As part of the Dutch Book Week celebrations, I’m very pleased to present an extract from Renate Dorrestein’s The Darkness that Divides Us. 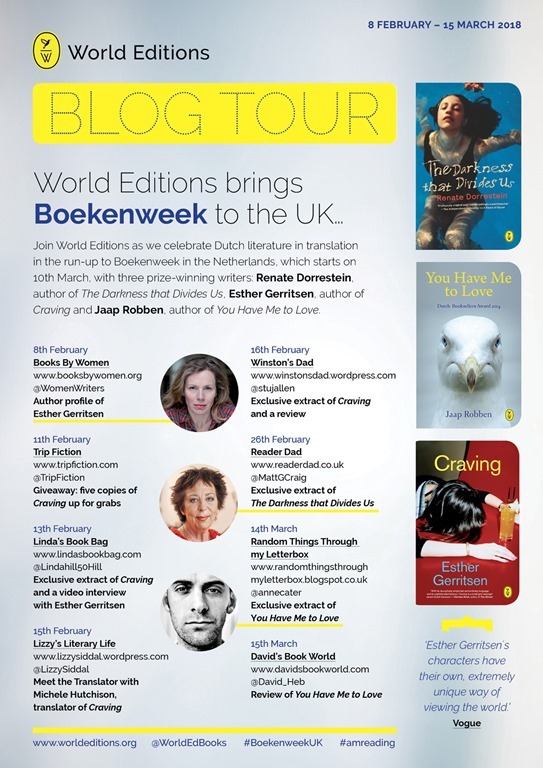 Follow the conversation on Twitter using the hashtag #BoekenweekUk. We must at some point have made up our minds never to exchange another word with her, because, as if by prearrangement, there was always a deathly silence the moment she came into view. We’d clamp our lips shut and look the other way when we saw her coming into the schoolyard or when we passed her in the street, playing hopscotch or marbles all by herself. When had it started? It must have been the year we learned to read, in Miss Joyce’s class. So long ago, anyway, that it was as if a ring, faint but unmistakable, had gradually been drawn round her, marking the spot where she was standing, walking, or sitting: a sign that she had been singled out as a target. As the scapegoat. Our silence did not mean we didn’t have anything to say to her. We wanted there to be no mistake about that, and that’s why we often lay in wait for her after school. Four of us, or six, or, if there was nothing else going on, a bunch more. We’d hide in the shrubbery on the old village green, behind the hornbeam hedge whose leaves in spring were the colour of chocolate. In front of the hedge stood a bench overgrown with brambles. In the old days, when the green was still being maintained, it was a popular spot for courting couples. Now it was mostly deserted. But it wasn’t considered particularly unsafe, since it was overlooked by all the houses surrounding the green; anybody could see what was happening out there, unless everybody happened to be looking the other way at the exact same time. Elbowing one another in the ribs, we hid behind the hedge. The moist earth was crawling with spiders that tried to scramble away on buckling legs when you held a match to them. They made a popping sound as they burned; the shrivelled little ball gave off a measly puff of smoke. As soon as we saw her coming, we put away our matches and ducked. We were packed so close together that we were just one big huddle of quivering muscle and flaring nostrils. On the other side of the hedge we heard her pace slacken. Her footsteps slowed until she came to a sudden halt. She was weighing her chances, probably: her after-school tutoring session had run a little longer than usual, dinner smells were already wafting out of the open windows, the street was empty; all the kids had been called inside. Maybe today was her lucky day. She started fidgeting, her fingers plucking at a hem, as if trying to find something to hold on to. Her clothes were always a muddy colour. It was only to be expected of those Luducos, our mothers said, shaking their heads. Men didn’t know how to do the laundry, nor did they have a clue about dressing a little girl properly. ‘The poor child,’ they said. We stared at each other, our cheeks bulging with excitement. Nobody wanted to go first, or worse, last. That thought spurred us to leap out, all together at the same time, to block her way. Arms crossed, legs planted wide, chins raised. A human barricade. Her mouth and eyes rounded into perfect Os, her face grew so pale that the freckles looked like ants crawling across her nose, and her carroty plaits, which she had grown long again just to annoy us, sprang loose from the shock. The moment she disappeared from view we were overcome with the urge to shake ourselves like dazed, wet dogs. Suddenly we felt a pressing need for noise. We started making a racket, yelling whatever came into our heads, to convince ourselves we had every right to put her on notice that for the rest of her days her life was going to be a living hell. Tomorrow we would make her pay. Or, better yet, a few days from now. Just as she began to think she was safe again, we’d give it to her good, we would. This year was our last chance: soon we’d be turning twelve, and at the end of the summer vacation we were all going to different schools. At home they had already started gazing at us sentimentally, reminiscing about our happy childhood, which, they said, was very nearly over.